".....and Padmini are fascinating to a certain extent for the innovative nature of their imagery derived out of landscape motives. Birds and animals are well knitted with pictorial logic. A subtle symbolism also plays a part in their works....Padmini, one of the promising young painters of the south appears to be interested in evolving a suitable idiom to express the poetic charm of rural life." "The lyrical and poetic take its different attributes in Krishnamurthy, Padmini and Sunanda." "'The bird' and "Girl with a kite" in oils by T.K. Padmini show an exquisite sense of the palette." Above: A sketch from the brochure brought out on a posthumous exhibition of paintings and drawings by T.K. Padmini. "A certain Gauginesque luxuriance of color distinguishes Padmini's paintings. Her women live or idle amidst tropical trees and brooks full of flowers and green verdure, surrounded by blue hills and undulating landscapes. 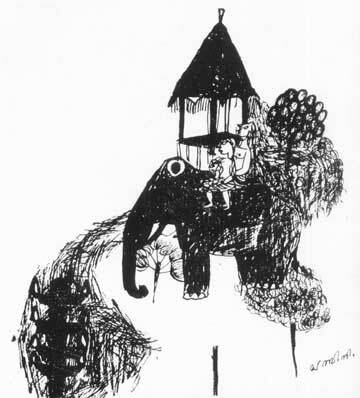 Her more recent work reflect the styles and techniques of fellow painters in Madras, but Padmini still maintains her distinctness of personality. She has evidently digested these influences and made them part of her own self. Her approach to painting is romantic in character and one feels that her technique should lend itself to mural painting admirably. "The only woman painter, Padmini portrayed strength of personality in the bold use of colours and her "figures in landscape" was one of the most outstanding of the six on display." "Miss T.K. Padmini is among the most original, Except when her work is too dark (figures in landscape). She created splendid nudes, with strong emphasis on lines she likes, and in bold compositions." "Padmini has moved to a greater sharpness of lines. Her recent work (e.g. "Gay Life") is concerned with the depiction of fantasy and abounds in flowing lines, but it does not have the lyricism of her earlier Gauginline "Meditation". She has gained in precision although parts of some of her paintings are marred by an excess of lines, which borders on the scribe."